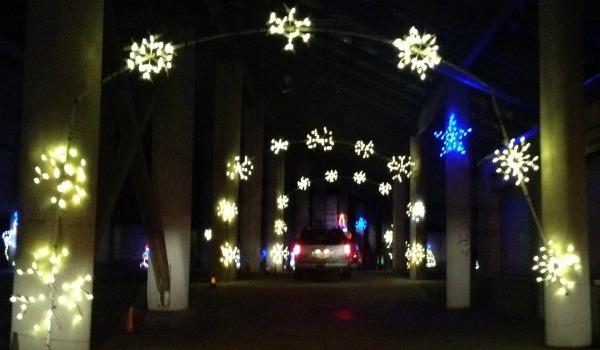 Last year we attended the Gift of Lights at Texas Motor Speedway as guests. This year we loaded up the SUV with extended family and re-took the tour. We went last night and it was a ton of fun. You can get more information about the hours of operation at the Gift of Lights website. We went on a weekday at around 8 pm and there wasn’t another car in sight until we were 1/2 way through which made it fun to go at our own pace. 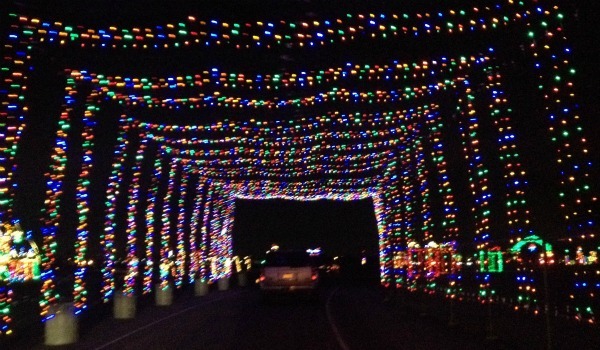 The Gift of Lights is a 1.7 mile long drive-thru light display boasting nearly 2 million lights. I was shocked to learn because these lights are all LED, they expect the electricity bill for the exhibit’s 45 day run to be around $700! That just proves how much more energy efficient these lights are then the ones on the front of my house. I really enjoyed the family time in the car. Everyone was pointing out their favorite light display while I was trying to take a few pictures, not rear-end the car in front of me and stay in the conversation. That is why these pictures are a little fuzzy…please know that the real thing is better than my photographs! The tour starts in front of the Speedway Club building, over the bridge and then UNDER the seats! It was funny to try and identify concession stands and other landmarks I had seen at races. This time it is dark and illuminated with thousands of lights in various lighting displays from trains to Santa riding a longhorn. From a castle with a princess to the baby Jesus. From snow and reindeer to a menorah. As the car found the end of the stands, then there is a turn to the parking lot area where more displays start with a large Christmas tree. This is DFW’s largest holiday light show. The entrance fee is only $15 per car Monday – Thursday and $20 for each car on Friday-Sunday. Each car receives a free photo with Santa in Santa’s Village. The Gift of Lights is now open and will continue through January 6, 2013. We went last night. I’d seen this type of thing done before and it is a wonderful idea. Tx Motor Speedway has alot of lights. Unfortunately most all of it is drive thru under the bleachers. That really took away from the whole experience. I dont know if they just dont have the driving space to put it all outdoor but it would have been much much better if they had. Overall we were disappointed at the effectiveness of it inside. It could have been dazzeling. Maybe next year if they have it they could move it outside or to another location. My kids love Christmas lights — this is perfect for them. I can’t wait to go!